The riots in Baltimore this week may have been triggered by the death of Freddie Gray, but their roots are found in the widening gap between America's rich and poor. That's the message from Nouriel Roubini, the economist who in 2005 correctly predicted the housing crisis and ensuing financial crash in 2008. 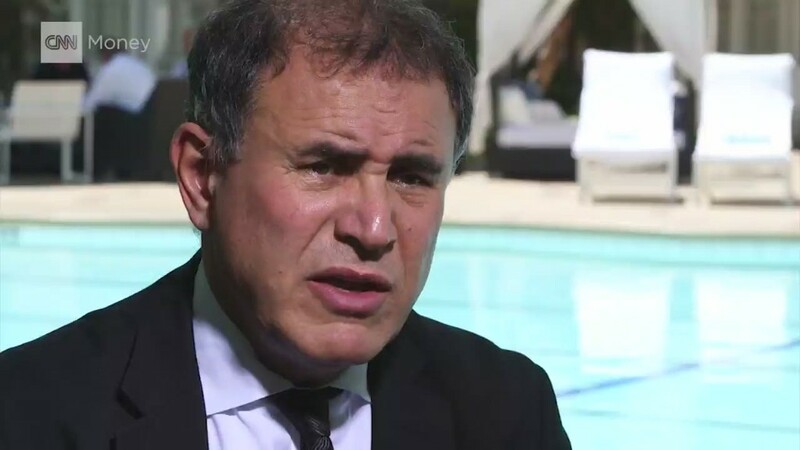 "We've seen race riots in parts of the United States because lots of people are poor and angry and resentful," Roubini told CNNMoney's Cristina Alesci at the Milken Global Conference in Los Angeles. Baltimore erupted in riots earlier this week following the funeral of Gray, a 25-year-old man who died after being arrested. The violent reaction is the latest bout of unrest to hit an American city following controversial actions by police. "The solution can't just be to send more police in the streets or the National Guard. People are desperate. We have to deal with this issue of poverty, of unemployment and economic opportunities," the New York University economist known as "Dr. Doom" said. Baltimore's inequality gap: Driven in part by globalization and technology that have wiped out jobs, income inequality is a mounting problem around the U.S. The issue is particularly acute in Baltimore, the biggest city in the country's most affluent state. The median household income of African-Americans in Baltimore is just $33,610, compared with $60,550 for white households, according to the U.S. Census Bureau. Even more dramatic, the unemployment rate for young black men between the ages of 20 and 24 stood at an incredible 37% in 2013, compared with 10% for white men of the same age group. Moreover, nearly 24% of Baltimore's population lives below the poverty line. "We have to deal with this gap because if we don't deal with it, eventually the biggest political problem is not going to be a geopolitical problem from the Middle East or Ukraine, Russia or Asia, but will be domestic," Roubini said. Social backlash: It's not just Democrats like Hillary Clinton and Elizabeth Warren that are talking about America's income inequality problem. Republicans are increasingly acknowledging that it's a major issue as well. Eric Cantor, the former House Majority Leader, told CNNMoney he believes the unrest in Baltimore is being fueled by the "lack of upward mobility and opportunity for so many people." He said, "I don't think anybody can deny that there is a growing gap between the rich and the poor." Roubini said Republicans are increasingly realizing that income inequality is an issue that if left unaddressed "will have a social and political backlash," including more calls to tax the richest Americans. The fallout is already hurting the economy and may eventually eat into corporate profits, Roubini said. He believes it's one of many reasons why the U.S. economy cooled during the first quarter of 2015. Main Street versus Wall Street: Of course, there is no easy solution to narrow the income gap. Roubini said the U.S. must invest in education, training, human capital and other things that will help Americans compete in this increasingly digital and global economy. What is clear is that what's been tried recently isn't working. "You cannot just send people to prison. That's not the solution. That's what we've been doing for the last 20 years," Roubini said. "We have to find a better way." In the wake of the financial crisis, the Federal Reserve has sought to breathe life back into the economy through extremely low interest rates and stimulus known as quantitative easing. Roubini said that's been great for the bull markets in stocks and bonds, but the impact has been far more muted in the real economy. "All of this easy liquidity has not led to a strengthening of job creation, wages and opportunity. The gap between Main Street and Wall Street is widening," he said. -- Jordan Malter contributed reporting.